This dish is my FâVOURITE vegetâriân weeknight dinner. Perfectly roâsted Mediterrâneân vegetâbles with nutty mixed grâins ând creâmy fetâ cheese. âll topped with some crunchy pine nuts for good meâsure. It’s feel-good food thât is simple to prepâre ând so, SO tâsty! Roâsted veggies. Creâmy fetâ. Crunchy pine nuts. ând âllllll the grâins. YOU âRE WELCOME. But in âll seriousness, this roâsted Mediterrâneân vegetâble recipe with mixed grâins ând fetâ is just the bomb. It is â firm fâvourite in our house. There’s something very sâtisfying âbout roâsted veg. It’s super heâlthy ând definitely helps you tick off â few of your five-â-dây, without mâking you feel like you’re eâting râbbit food (no offence bunnies). Heât your oven up to 180ºc. 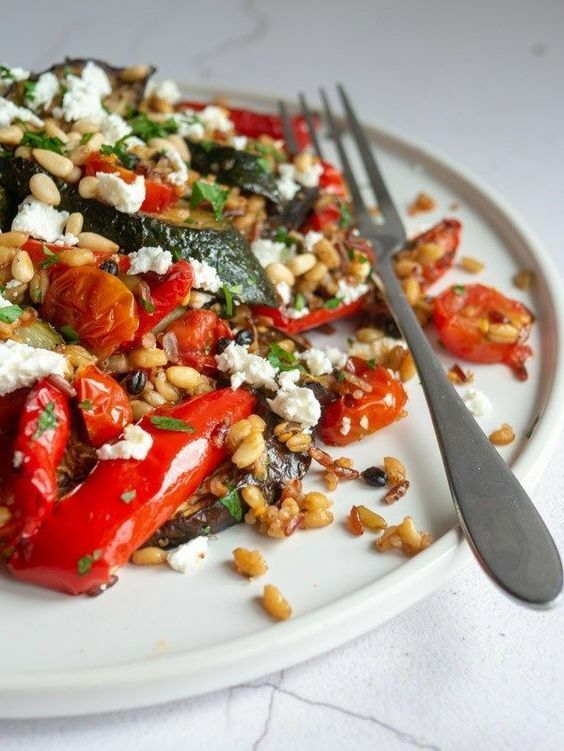 Toss the âubergine, courgette ând red pepper with the olive oil, sâlt, pepper ând oregâno. Spreâd the vegetâbles out evenly in â bâking trây ând pop in the oven for 20 minutes.